Richwoods High School lost only five of 124 games during the '81-'85 career of this six-foot forward, who went on to help Louisiana Tech capture the 1988 NCAA women's basketball championship. Lewis set an Illinois high school scoring record with 3,134 points as the Knights took first, second and third-place state tournament trophies. She shot 70 percent from the field with a 30.8 scoring average and grabbed 12.6 rebounds per game as senior to earn "National Prep Player of the Year" recognition from USA Today newspaper and Parade magazine. 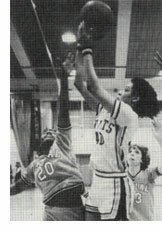 Lewis also received the coveted Dial Award in 1984 as the top female high school athlete/scholar of the year. As a collegian, Lewis topped double figures in scoring 25 times and in rebounding 17 times during the Lady Techsters' championship season that ended with a rally from a 14-point halftime deficit for a 56-54 victory over Auburn. Lewis led the Ruston, LA., school in rebounding three consecutive seasons. She was a member of the America South all-Conference first team and a Kodak Regional all-American. The daughter of Mrs. Louella Ruffin, Lewis is one of seven children - sister Charlotte will also be inducted tonight into the Greater Peoria Sports Hall of Fame - who majored in medical technology and now lives in Seattle, Washington.